Papua New Guinea Prime Minister Peter O’Neill says the economy will be hard hit by the closure of the PNG LNG Project in Hela after Monday’s 7.5 magnitude earthquake. He told The National in Mt Hagen after an unsuccessful attempt by helicopter to reach Tari in Hela and Mendi in Southern Highlands that the closure of the oil fields and the gas fields “is a concern to every one of us”. The National Executive Council is having a special meeting today to discuss how to address the disaster. O’Neill returned to the Kagamuga Airport in Mt Hagen Tuesday after the helicopter carrying him to the earthquake-hit areas was forced to turn back because of bad weather. He was accompanied by Hela Governor Philip Undialu, Tari-Pori MP James Marape, Komo-Margarima MP Manasseh Makiba and Koroba-Lake Kopiago MP Petrus Thomas. Another helicopter carrying Works Minister Michael Nali, Kagua-Erave MP Wesley Raminai, Works Secretary David Wereh and Kumul Petroleum Holdings managing director Wapu Sonk managed to make it to Mendi. “We’ve despatched teams from the Defence Force and also the National Disaster Office,” O’Neill said. O’Neill said it was a natural disaster which could not be blamed on anyone. “It’s unfortunate, given that the economy is slowly recovering after the challenges we have been facing for many years,” he said. “The economy is starting to turn around, the commodities are starting to pick up, and now we are given this challenge. “We just have to work harder, persevere, and make sure that our people’s lives are not disrupted. O’Neill said he had received reports of the gas and oil fields removing non-essential staff, particularly at Kutubu and Hides. “It is mainly for their safety until it is determined whether it is structurally sound for them to open the gas fields and the oil fields,” he said. 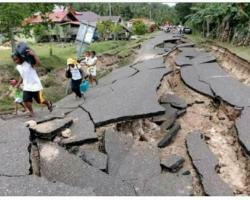 “In Ok Tedi, the damage is not as bad as it has been reported. I got a report from the managing director of Ok Tedi this morning. “There has been some road slippage and blockage of access to the mine, but I’m told that they’re clearing that, and the mine should resume sooner than we anticipated. “The closure of the oil fields and the gas fields is a concern to every one of us. “It will have a huge impact on our economy, but we will work with experts to see if we can get it operational as quickly as possible. O’Neill said his helicoper went as far as Tari Gap before being forced to turn back because of bad weather. “We turned back, tried to go towards Benaria on the other side of the mountains, all the way to Ekiko. But we turned around and came back,” he said. O’Neill thanked companies such as Digicel and PNG Power which were working around the clock to restore communication and electricity in affected areas. “They’re doing a very commendable job under extremely difficult circumstances,” he said. “We thank all public servants and company employees who are out there working hard to restore some of the towers that have fallen and the power lines that have fallen.